It's time for your vacation on the queen of beaches and Miami Beach vacation rentals has the most economical accommodations available. These house, condo, villa and beach vacation homes have been designed and decorated especially for the Florida visitor. Luscious tropical tones set the mood, with interiors and exteriors that will have you feeling and thinking like a native. 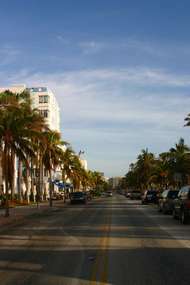 Miami Beach vacation rentals can be found conveniently located near shopping and public transportation. With greater location choices and amenities than hotels or motels, Miami Beach vacation rentals are almost always the better choice. In the late 1800's, when John Collins first began to dump sand on what is now Miami Beach, he never envisioned it as a tourism Mecca. As a hard working farmer and Quaker, his religious upbringing would remind him that hard work was its own reward. He might not want to see the end result of his efforts today but you'll sure not want to miss highlights such as Lincoln Road, a pedestrian outdoor area, with its art galleries, sidewalk cafes, open markets, upscale shopping and people, people, people - day or night. Nor the famed art deco district of South Beach, where you can drive or walk, bathing in the neon light, savoring the spicy aromas from the outdoor cafes and moving to the Latin beat. A drive down Collins Avenue takes one by some of the most famous hotels in the world and - just maybe - by some of the most well known celebrities in the world. Let's not forget that beautiful Atlantic-washed, palm tree-studded beach, either. Your stay on Miami Beach will simply be more memorable when you explore from roomy, comfortable Miami Beach vacation rentals.